Students can create and edit Wixie projects from a phone … in the car … on the way to school, soccer, gymnastics, piano, ballet, or ... you get the idea. Teachers can use Wixie on their phones to assign activities and grade student work from the comfort of their favorite chair or as they grab their morning coffee and realize they want to add another activity to student centers or station rotations that day. Admins can make quick data changes in Wixie from their phones. So, even when they are off site, they can quickly add a new student or update class rosters on the go. 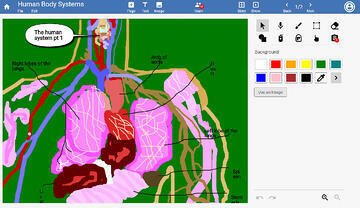 Wixie will still have an app for iOS and Android, but the new version will also work in a browser on those devices. This makes training easier in a mixed device environment where students are used to logging into Wixie from a browser. 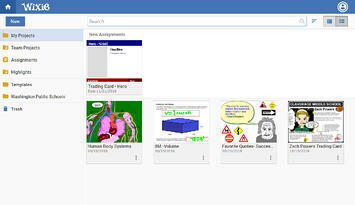 Teachers can choose the Wixie interface that best matches their students. The Primary look is brighter, larger, and has a simplified feature set to make it easier for younger students to get started making their first projects. The Standard look includes all of Wixie's features in an updated, modern interface. Teachers can quickly browse student work by filtering projects by a specific assignment, standard, project name, or date range. If your students are creating in Wixie every week, you can filter to see only the assignment you want to review for formative assessment or grading purposes. The URL Wixie shows in the address bar is the URL you use to share the project, making it easier to take advantage of the built in sharing tools on phones, tablets, Chromebooks, and desktop computers to showcase student learning. Wixie will include text-to-speech options that allow users to hear text on a page. Emergent readers and second language learners can listen to written passages as many times as they need to gain a deeper comprehension of the text. Struggling writers and/or students with learning challenges, such as dyslexia, can listen to pronunciation of words they have spelled and structure of the sentences they have written and to help identify necessary corrections. Students can add hyperlinks to text and images in Wixie to connect their viewers to additional resources. They can even use a hyperlink to create interactive experiences with sensors or LEDs that bring a digital project to life. Check to see if your browser is compatible. This Wixie update will release in the summer of 2019. Keep an eye out here for information on video tours, webinars, and release timing as we work to make sure you have the information you need for a seamless transition.